When Wayne and Kelly Maines adopted identical twin boys, they thought their lives were complete. But it wasn t long before they noticed a marked difference between Jonas and his brother, Wyatt. Jonas preferred sports and trucks and many of the things little boys were supposed to like; but Wyatt liked princess dolls and dress-up and playing Little Mermaid. By the time the twins were toddlers, confusion over Wyatt's insistence that he was female began to tear the family apart. In the years that followed, the Maineses came to question their long-held views on gender and identity, to accept and embrace Wyatt's transition to Nicole, and to undergo an emotionally wrenching transformation of their own that would change all their lives forever. Granted wide-ranging access to personal diaries, home videos, clinical journals, legal documents, medical records, and the Maineses themselves, Amy Ellis Nutt spent almost four years reporting this immersive account of an American family confronting an issue that is at the center of today's cultural debate. 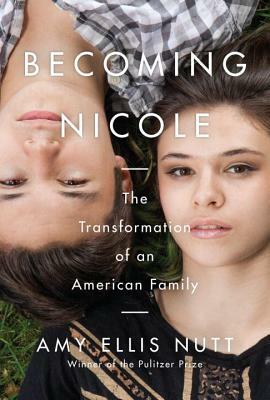 Becoming Nicole will resonate with anyone who's ever raised a child, felt at odds with society's conventions and norms, or had to embrace life when it plays out unexpectedly. It's a story of standing up for your beliefs and yourself and it will inspire all of us to do the same. Amy Ellis Nutt won the Pulitzer Prize in 2011 for her feature series The Wreck of the Lady Mary, about the 2009 sinking of a fishing boat off the New Jersey coast. She is a health and science writer at The Washington Post, the author of Shadows Bright as Glass, and the co-author of the New York Times bestseller The Teenage Brain. She was a Nieman Fellow in Journalism at Harvard University, a Ferris Professor of Journalism at Princeton, and an instructor of journalism at the Columbia University Graduate School of Journalism. She lives in Washington, D.C."